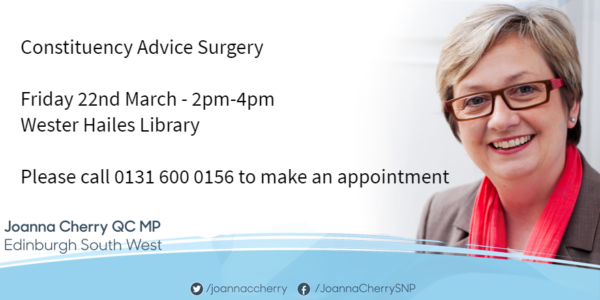 Local MP Joanna Cherry will be holding her next constituency surgery at Wester Hailes library on Friday 22 March 2.00pm – 4.00pm allowing local residents to bring any issues or queries to her attention. Call 0131 600 0156 to make an appointment. You can also follow her Twitter or Facebook for updates on her Surgeries. If you are unable to make it to the surgery or would rather speak with someone else, you can find a list of the contact information and surgery times of your other political representatives here.